We provide advanced time and attendance system based on RFID (Proximity card). This product bears similar salient feature as of the above mentioned finger print based time & attendance. It is provided with competitive price, smart design and wonderful functionality. Fingerprint Recognition Terminal (FRT) is a standalone Biometrics Fingerprint recognition based Time Attendance system with TCP/IP networking capabilities. FRT consists of a robust standalone Fingerprint terminal with LCD, Keypad, Fingerprint scanner, 800MHz processor, memory, communication and storage capabilities. FRT does not depend on computer or external resources for its operations though it can work together with multiple FRTs to provide centralized database and management capabilities. FRT is equipped robust Optical Fingerprint scanner with high quality fingerprint scanning and long life. It is not a low cost semiconductor scanner which is mainly for personnel use and cannot handle heavy scanning like in Time Attendance systems. 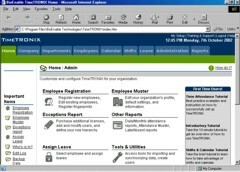 FRT includes easy to use feature rich Time Attendance management software called Time-TRONIX TA. This is browser based software with easy to use graphical interfaces and context help. Time-TRONIX TA software can be installed on a single computer, LAN or Internet. FRT is a standalone time attendance system with its own processing and storage capabilities. At the same time it support fast 10/100 base-T Ethernet TCP/IP networking with ability to network with central server and use both on system or on server processing/databases. It is based on proven optical fingerprint scanning technology with 3D Live finger detection. Surface of the scanner is scratch-resistant and it is not possible to scratch it even with a blade or nail, this gives good quality fingerprint scanning throughout the life of the scanner. Other scanners even with protective layers develop scratches over time and the quality of scanning degrade. Scanner is also free of any electrostatic problems. FRT is very powerful system with 800MHz processing power close to computers. This allow FRT to support fast 1:N matching where employees are not required to enter ID before matching fingers. Most other fingerprint system though claim to support 1:N matching (fingerprint only) but this is very slow hence they are always used in 1:1 matching (ID + fingerprint). FRT can offer more then 100 fingerprint matches per second. Fingerprint scanner has been practically tested with wet fingers, greasy fingers, smeared fingers, oily fingers and gives consistent performance for most practical situations. Fingerprint scanner has finger guide which makes it easy for employees to give finger scan. FRT has a auto-scanning mode in which users are not required even press ENTER key to to activate scanner. This along with other options can give you very fast transactions to avoid queuing up in morning and evening IN/OUT.